In June 2010 I headed to France to go to the unveiling of the Tunnellers Memorial at Givenchy. While there I took the time to visit Messines Ridge and find as many of the famous 19 mines blown on that fateful prelude to the 3rd Battle of Ypres in June 1917. Despite writing my undergraduate dissertation on the Tunnellers of the Great War I had never actually been to that area. As soon as I saw Peter Barton on BBC News looking for the relatives of Thomas Collins who died alongside William Hackett VC in Givenchy, I knew that this was the best excuse to get over to France and do the trip I had wanted to do for a long time. I visited my Great Uncle's grave an Wancourt - a Machine Gunner, aged 22 years old who was killed by shelling near Arras. His name was William Cyril Newcombe. I paid my respects to him and his colleagues of the MGC who died on the same day - they lie next to him at Wancourt. From Wancourt we headed to Givenchy. While on our way I spotted a sign for Vimy Ridge. It wasn't in our plans to head there but I thought it would be a good place to visit. Boy was I correct. The sight was breath-taking! The sky was ominous behind the two towers and the statues in mourning were all the more moving for the gloomy weather. Not only was the monument incredible, the trenches cutting through the area were everywhere. I have to say that Vimy was the biggest surprise of the trip. I hope to visit there once more. On to Givenchy for the unveiling of the Tunnellers Memorial. This is where I get a little bit like a history groupy - if there is such a thing. Peter Barton was there. Peter helped me with my dissertation back in 2004. His wife was helping me with my research at the RE museum in Chatham, Kent. I was bowled over when she put me in touch with her husband who was an expert in the area. Little was I to know that he would be 'Mr Tunneller' and all over the TV over the next 6 years. He helped me a lot. As did Bryn Hammond at Imperial War Museum, and Simon Jones. Anyway, I digress. The memorial unveiling was inspiring. The reading by Jeremy Banning was deeply moving and the bag piper trully set the mournful, yet celebratory, tone of the day. To top it all, Peter signed by 'Beneath Flanders Field' book so that made the trip even more worthwhile. 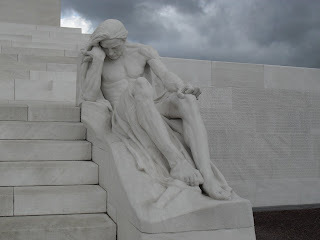 The following day we stumbled across The Ploegsteert Memorial. William Hackett VC is remembered there - a real hero of the Great War, but only one of many tunnellers who died the same horrific death. The saddest thing I found during our tour of the area, was that no matter how hard we tried we simply could not fit all the grave sites in. We would stop at one, then spot another. We would head over there and then see another. In the end, because of time constraints, we resorted to just slowing down and offering some kind of respect, whether it be a little salute or a nod of the head, or even a 'holler'. Not much I know, but hopefully enough to remind them that we haven't forgotten! After Givenchy we headed to Messines, Ypres and Passchendale. What a trip. When I saw my first mine crater, the Peace Pool, I got goosebumps. I just felt a chill like I had never had before. It was so big and to think of all those poor men that died there was heartbreaking. We only found a few more - or at least, could only get to a few. At Hill 60 we visited the Caterpillar, or the Catter Pillar, if you rely on the signposting there. It is not an obvious one to find, and I found it was the creepiest of all of them. Maybe because of it's location in the woods. It is crazy to think of Hill 60 as such a bloodied piece of land, when you first see it. Such a small bit of land. A couple of weeks ago I watched a film called 'Beneath Hill 60' and I had exactly the same reaction as the chaps in that film - 'it's hardly even a hill'. There were many more sights on my trip and I know that there is plenty more for me to visit. I plan, one day, hopefully when I finish my book, to go out there and visit as many graves as I can of those men & women from Newport who gave their lives in the Great War. Watch this space!